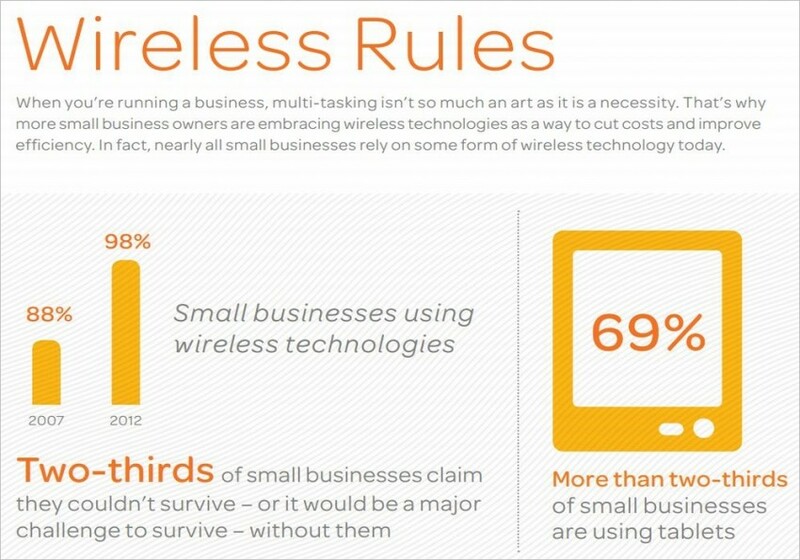 Nearly all (98 percent) small businesses use wireless technologies in their operations, a 2013 AT&T small business technology poll says. Details of the poll released recently also reveal how dependent upon wireless technology most small businesses have become. For example, the survey shows two-thirds (about 66 percent) of those businesses would be unable to survive or would be severely challenged without wireless. “For small businesses today, wireless solutions have become part of their DNA,” said Cathy Martine, AT&T executive vice president of small business solutions in a release earlier this year. The poll also reveals additional details about the choice of wireless technology for many small firms. Smartphones — Small businesses depend on their smartphones – and usages keeps growing. The poll found 85 percent of small businesses use some kind of smartphone in their operations (even if it isn’t the latest generation). That’s double the number five years ago. Tablets — Just over two thirds (69 percent) of small businesses now say they use tablets in their operations. That’s a bit up from the 66 percent of small companies that said they used the devices last year. Interestingly, the use of tablets increases with the size of the business. Ninety percent of firms with between 51 and 99 employees use tablets, while only seven in 10 (69 percent) of firms with 50 or fewer employees do so. Newer businesses are also more likely to use tablets. The survey found 80 percent of small businesses less than two years old use tablets in their operations, while just 69 percent of those two years and older use them. Mobile apps — Despite all the hundreds of thousands of apps available today, only 31 percent of small businesses in the survey say they use apps in business. But of the ones who do, almost half say they couldn’t live without them. The survey paints a picture of tech-savvy small businesses far removed from the old stereotype of small businesses as technology laggards. Small business owners are probably not surprised by the popularity of wireless technology in business operations. It brings productivity and allows small business personnel to be mobile instead of stuck in the office all day. AT&T’s 2013 Small Business Technology Poll was conducted with 1,000 small businesses in 50 states and the District of Columbia surveyed from December 18 through December 27, 2012.